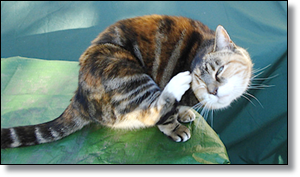 In addition to allergies, there are other diseases which can cause your cat to scratch, lick, or pull on her hair. A short description of these conditions such as mange, cancer, behavioral problems, and infections, along with their diagnosis and treatment, are shown in the table below. Many of the more uncommon conditions are included as well. This large number of conditions helps you understand why a quick diagnosis may be difficult to make and various diagnostic tests may need to be performed. The most common conditions are color-coded gray in the table (some may be more common in certain geographical areas).